Scotching the cosy myths peddled by Paul Newman and Robert Redford in Butch Cassidy and the Sundance Kid, this routine B-movie western reveals a very different side of the two outlaws. Philip Carey plays the Hole in the Wall Gang member, out of jail after serving a three-year prison term, who promises Martha Hyer that he's going straight. But he is blamed for a bank robbery that Gene Evans's greedy Cassidy has done, and decides to ride with the gang again until he can clear his name. Carey is better known for his dependable support in the likes of Calamity Jane. He works hard at this rare lead, but lacks heroic presence. 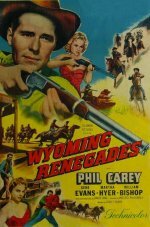 Western starring Phil Carey, Gene Evans and Martha Hyer. Outlaw Brady Sutton is desperate to go straight, but his association with the bank-robbing Butch Cassidy makes Brady's girlfriend Nancy wonder whether her man is ready to change his ways.